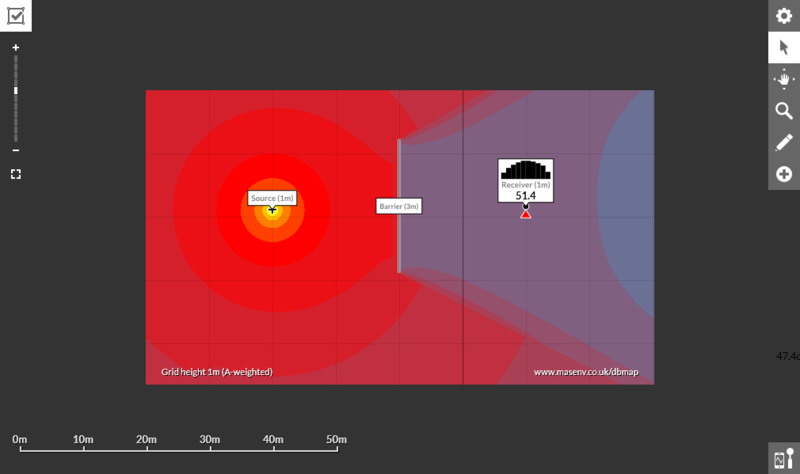 Create complex sound level models for free in your browser. Add point sources, barriers, buildings and receiver points with frequency information. See the sound paths and how these are affecting the levels. Interact with your model, modifying positions and parameters and see the calculation results instantly. Learn through exprimentation how the calculations of ISO 9613 parts 1 and 2 are implemented and how they affect predicted levels. Built into your browser, your model is stored in the location bar making it easy to save and share your interactive models with other people. 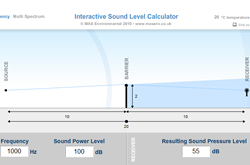 A decibel sound level calculator with interactive diagram for combining reduction due to propagation over a distance, insertion of a barrier, ground effect and air absorption using ISO 9613 methods of calculation. 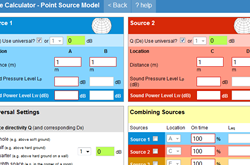 Original noise calculator - up to 3 independent point sources of noise at different distances and durations.